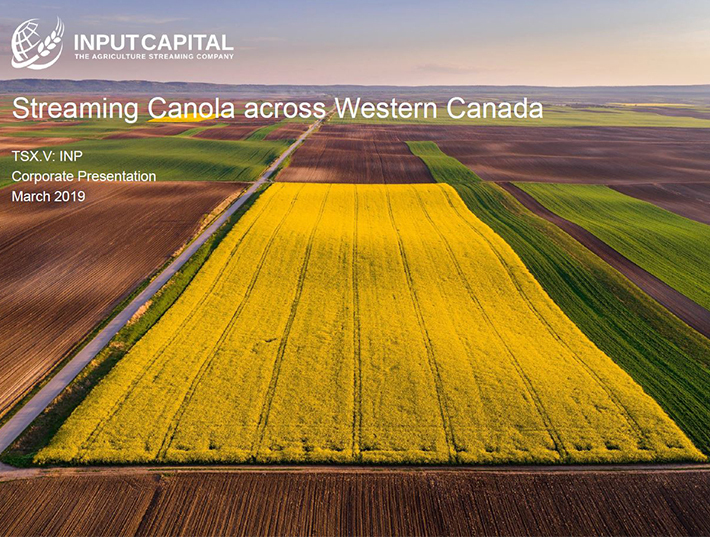 REGINA, July 25, 2018 /CNW/ - Input Capital Corp. ("Input" or the "Company") (TSX Venture: INP) (US: INPCF) is pleased to announce that it has completed its first credit agreement for mortgage stream financing with Concentra Bank, the wholesale bank and trust company for Canada's credit unions. The Concentra credit facility (the "Facility") provides for up to $10 million in term debt secured against the mortgages underlying the mortgage streams Input has with its clients. The Facility finances up to 90% of the original mortgage principal at a fixed interest rate of 4.33% p.a. for a term of five years, which matches the duration of Input's mortgage streams. By allowing Input to margin its mortgage streams, this Facility reduces Input's capital required to originate mortgage streams, significantly improving returns on equity while enhancing Input's ability to build a larger book of mortgage, capital and marketing streams. Doug Emsley, President & CEO of Input, said: "This facility establishes a template for additional mortgage financing facilities with Concentra and/or other financial institutions. We look forward to being able to grow the amount of capital available to fund our mortgage stream business by expanding and/or replicating this facility many times over. "Over the course of this summer, Input has participated in two large farm trade shows in Saskatchewan in order to spread the word about the Input mortgage stream offering. We are very encouraged by the feedback and response – in the words of farmers: 'No bank has ever offered a five-year price guarantee for my canola – that's interesting;' and 'This mortgage stream product deserves a look.'" Since launching mortgage streams in January, Input has seen rapid acceptance in the marketplace and approved forty three mortgages for a total of over $28 million in new mortgage stream deployment.